Reading while waiting for the MRI. Last March Bekah had an MRI of her eyes. Unlike most people, who can cross their eyes, Bekah can un-cross hers. It usually only happens when she tucks her chin down and looks up, and happens more when she seems tired. In an effort to make sure that there was no need for any kind of surgical intervention, Dr. Lawhon ordered an MRI. We learned that Bekah is indeed missing a nerve that would help to control her eyes. It’s not a big deal since vision isn’t hampered in any way. It’s called Duane syndrome, and it’s something to watch, but not something to be afraid of. Along with what we were expecting came the unexpected. There were some mysterious white spots on Bekah’s brain. Dr. Lawhon talked with a neurologist before even calling us so that he could assure us that there was probably nothing to worry about. The “spots” didn’t seem like a cause for concern, but we should schedule another MRI for a year later. Well, one year later, as I sat holding Bekah beside the MRI machine softly singing “Jesus Loves Me” as the sedation medicine began working, I realized just how much I had thought about those results over the past year. Each time the “spots” crept into my mind, I reassured myself that it was probably nothing. A few times I even tried to convince myself that it was leftover glitter on her scalp from an art project. Every time, though, I was reminded of the sweet, loving care of Akron Children’s Mahoning Valley sedation team. Bekah with her bag of toys all ready to go. Once again, Dr. Schaffer and the sedation team were incredible. Even though Bekah fought them on getting an IV this time, not because it hurt, but just in case it might, they remained downright AWESOME. After about 45 minutes, Chris and I could hear Bekah’s voice. 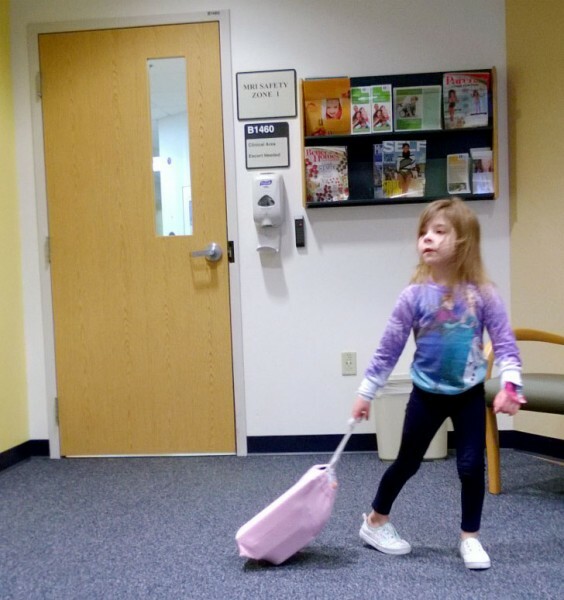 Dr. Shaffer was carrying her down the hall because she was still too sleepy to walk, and they were discussing the sounds they could hear from a baby who was next in line for the MRI machine. 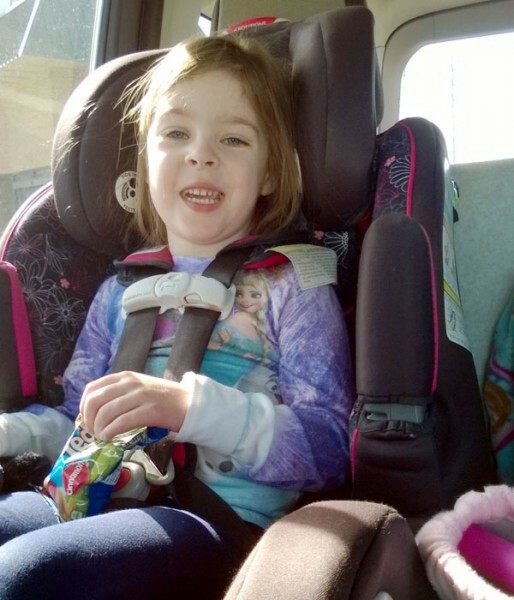 On the way home with her post-MRI-snack. 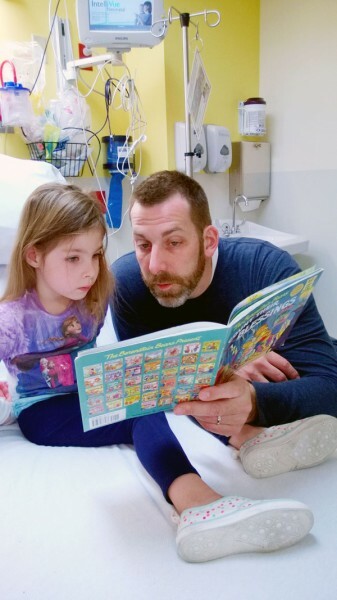 It’s moments like those that reassure us, as parents, that our daughter is in the perfect place when we are at Akron Children’s Hospital. Oh, and the results – the spots are still there and are unchanged. This year’s MRI shows what looks to be an insult to the brain that may have happened sometime as long ago as before she was born, something, like a heart with two gaping holes, that was beyond our control. The delivery of the results though, at 7:30 on a Friday night, because Dr. Lawhon didn’t want us to have to have any unanswered questions from a voicemail he’d had to leave with us earlier in the day, adds a layer of love to our incredible respect for Dr. Lawhon, and allows us to repeat again how deeply we appreciate the care Bekah receives as a patient of Akron Children’s Hospital.